Rob Wallace, F.I.E.A, Dip Mech. Eng. (RMIT 1966), has spent most of his career as a design engineer. First job was with Ordnance Factory, then Repco Research (manufacturing processes) with a break in UK (nuclear power station maintenance equipment). In 1971 he took a position with Country Roads Board, Victoria designing specialist road-making machinery (snow blower, linemarking). In 1977 Rob became self-employed, and with a colleague established an aluminium picture frame manufacturing business, Elecon Products, which grew rapidly, expanding to New Zealand with a manufacturing under licence agreement. In 1979 Rob sold his share of the business, moved to Northeast Victoria, became a partner in a civil engineering consulting practice with another colleague, and developed a mechanical engineering clientele including building services, agricultural facilities (grain handling, hop kilns), and industrial equipment (cranes, special purpose machinery). During this time Rob became involved with structural design, including bridges, introducing innovations stemming from his manufacturing background. In 1987 Rob established, with another colleague, a new company, “Waldren Bridges”, purchased a pile driver and began constructing farm bridges. 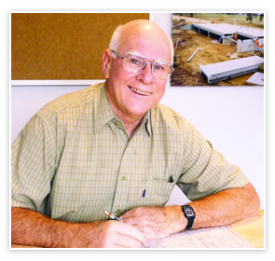 In 1990, the company split into two, Rob continuing as a one-man business developing and marketing his patented “Quikdek” and Bridgette” precast modular bridge systems, mostly to municipalities in Victoria & NSW. Rob gained a reputation for innovation and speed of construction, and over a 12 year period successfully completed the design and construction of more than 200 bridges, some of which were the subject of conference papers and excellence awards (IEA & AISC Australasian Steel Bridges). Even so, limited time and resources meant that not all innovations were developed; those with the greatest scope having to be put aside until adequate time and resources became available. Meanwhile Rob maintained his interest in things mechanical, developing and patenting “Easy Seat”, an automotive swivel seat which was a finalist in the BHP Steel awards and gold medal winner in Switzerland, leading to negotiations for manufacture under license in USA, and exports to Germany. After several years, a licensing arrangement was put in place transferring the Easy Seat business to another party. In 2000 Rob sold Waldren Bridges and expanded his other business, “Yaktek Industries” (tank level indicator manufacturing). A new factory was constructed and a full time manager was appointed and the business continues to thrive. In 2009 Rob established another company, RoundPeg Innovations Pty Ltd, specifically to in order to continue research and development of his innovations. Some of these, such as steel piles, pile testing, guard railing and steel girders, stem from Rob’s experience in bridge design and construction. Water heating is another area of interest, a radically different solar heating system and a device that eliminates the delay after turning on the hot tap. Person experience of problems led to the Flying Carpet boarding system. Other arose from solving problems such as more comfortable bicycle seat.